Everyone has a story. Each and every one of us has walked a different and distinctive path. We all can give a chronicled account of our life: a reflection of what we have encountered, how we have embraced those experiences and what we have learned on our journey. If we simply view it in a simplistic manner than we may unknowingly get stuck in the story, and never fully embrace what the journey is all about. 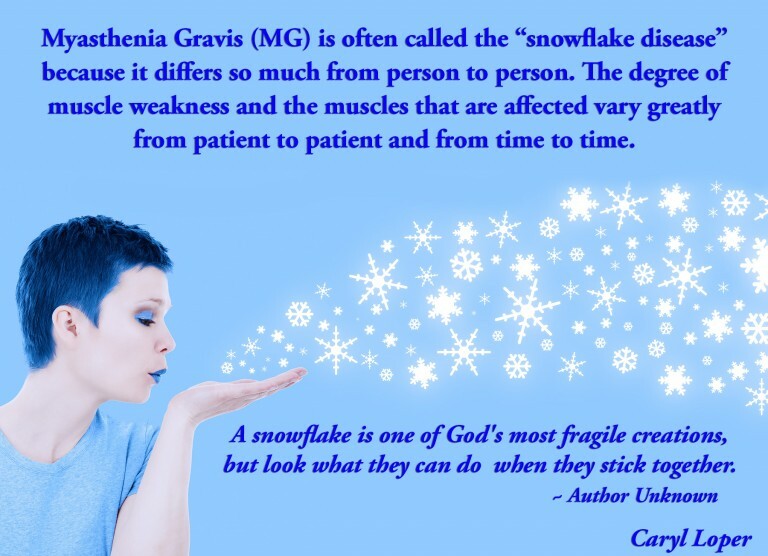 This September it will be exactly 36 years since my first encounter with Myasthenia Gravis, MG. I was awakened one morning to the most unusual world, a total shift in my visual reality. I awoke one day with a major shift in my vision, a visual discrepancy that in a blink of an eye never changed. At first I thought I would literally go mad, as it was so arduous and intrusive to my life. But, as life teaches us, we can choose to resist it and fight it, or go with the flow and accept it. I chose to accept it. Helen Keller, an admired and awe-inspiring author, led me from a dark place to the light. Her spiritual engagement with life, her uplifting and inspiring attitude taught me so many lessons about embracing the unknown, moving beyond any circumstance with strength and perseverance. We can choose to sit in darkness, or we can move to the light and embrace those shadows. I chose the light. From there I noticed many other symptoms that would move in and out of my daily life like the ebb and flow of the ocean. I was affected by various outside changes to my body from my eye drooping, severe and unrelenting fatigue, chronic muscle weakness, difficulty standing and walking, loss of balance, difficulty swallowing and breathing, memory and cognitive issues and more. With the initial onset of these symptoms I was diagnosed with Multiple Sclerosis, later to be retracted. Even though I went to various neurologists, I was only diagnosed 6 years ago with MG. My journey awakened me to how to appreciate life. My husband, Gary taught me . . . Within every situation there is a seed of good, no matter what the circumstance is. Our minds are powerful creators, and when we continually focus on the compounding aspects of any challenge we become overwhelmed with the adversity. With that, we now take the never ending cycle of the physical, emotional, psychological and spiritual pain, and we compound it and create a place of being a victim. That place creates suffering. Do you really want to suffer? So, how does one learn to deal with the many aspects of any adversity? I am fortunate that my husband, Gary, is a life and mindset coach. With his mentoring and my ongoing studies, I have been able to see the ‘seed of good’. all the subtle nuances in life. Each day I notice the beauty in the moment, the light streaming through my living room or a butterfly flittering about my garden. Often it is the simple things in life that bring us such peace, harmony and joy. Also, I have found that when I am busy giving to others, it lightens my pathway with joy and my burdens feel so much smaller. Be so busy giving that your troubles become small, and your love for others transcend everywhere, a reflection right back to you. Every time you touch someone’s soul, you have enlivened yours, awakened love everywhere. Taking it a step further, it is vital that the person that is dealing with the fluctuations of MG or any adversity allow their caregivers, friends and family to open up about their feelings. It is so critical. We often forget that our caregivers are hurting too, and the compounding affects any condition or disease will have on others. To receive understanding, compassion, empathy and love, you have to give it too! During the times I fall down emotionally and spiritually, through the grace of my beliefs and relationship with God, I feel renewed again. If we lead with hope then we have a sense of wholeness that all things are possible. I am a hopeful romantic about life, all aspects of life. I believe that all things are possible. Even if I never go in remission, I am led to create the best possible life with whatever my day may bring. Here’s to celebrating life!